For serious modular users (running OSX) the ES-8 would make a great purchase, and with decent expansion potential. Class-compliant, so no driver required. Mac and iOS only (at present). The ES-8 is a USB 2.0 multi-channel audio interface compatible with iOS and OSX hardware. 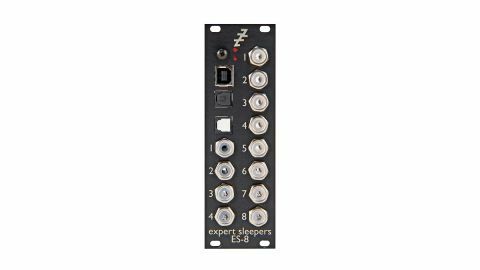 However, before diving into the detail it's worth considering why, with so many audio interfaces on the market, Expert Sleepers has decided to enter the competitive fray. The answer lies squarely in the fact that the ES-8 comes in Eurorack format, and that Expert Sleepers produce a whole panoply of hardware gear aimed at interfacing the analogue synth world with that of the DAW. Most of this would be of little use without appropriate software, and, unsurprisingly, this is available from ES in the shape of Silent Way, a suite of plug-ins that take care of CV/gate and trigger conversion, envelope and LFO generation. In essence these use your audio interface inputs and outputs and receive voltage-based control signals rather than audio. Unfortunately, audio interfaces are required to be 'DC-coupled' in order for this to work with static or very slow moving voltages, and the numbers of these are limited. While there are some workarounds, the maximum available CV range can still be a problem. Being class-compliant, it just requires plugging in to work with a Mac or iOS device. Enter the ES-8, a 12-in, 16-out, DC-coupled interface that claims an impressive CV range of ±10V on both inputs and outputs, and all in an unassuming 8HP unit with eight inputs and eight outputs on 3.5mm sockets plus an additional 8-in/outs available via the ADAT connectors. There is no legending to indicate the difference between analogue or digital ins and outs, though there is some (subtle) colour coding on the sockets, LEDs built into the socket to indicate signal level, a couple of indicators for USB connectivity and clock sync. Alongside the connections on the front panel there are two expansion headers on the rear PCB that facilitate interfacing with a range of other Expert Sleepers modules. For example, the ES-5 can provide up to 48 gate/trigger outputs, and there are a host of other modules adding additional ins and outs in various formats (including low jitter MIDI). The online manual is short, and lacks much detail, just focusing on the basic functions. This does mean CV range can still be problem. This does mean that connecting multiple ES modules is less intuitive than it might be. Luckily, being a class-compliant device means that the ES-8 simply requires plugging in to work with a Mac or iOS device. OSX helpfully allows the creation of aggregate devices, allowing you to use multiple interfaces within a DAW session - useful l if you want to use an existing interface in parallel for more conventional audio duties. Windows drivers are promised, though simultaneous interfaces may be harder to utilise as soon as ASIO is involved. One could, of course, use some of the ins and outs on the ES-8 for conventional audio duties, though these are all unbalanced, and the unit offers little in the way of additional functionality. The ES-8 was designed with a specific purpose mind, and in practice does it well.